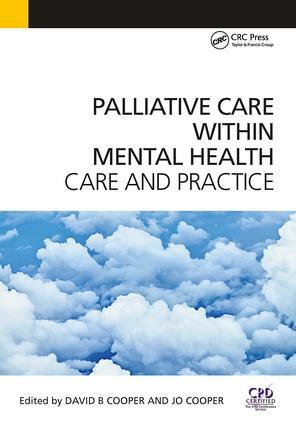 This thought provoking and highly practical book is not just about caring for the dying within mental health, but also applying the quality care and practice of palliative care within mental health practice. Multidisciplinary in its approach, it focuses on intervention, treatment, care and practice, and the similarities in practice between palliative care and mental health. This common ground is an excellent foundation for integrating palliative care into mental health care, practice and service delivery, succinctly covering all aspects of psychological, physical, social, spiritual, sexual and emotional health. Featuring authoritative contributions from international experts, each chapter develops a theoretical framework before broadening its scope to include application in practice - addressing what, when, where and why with a definite focus on implementation in practice. Self-assessment exercises, advice for further reading, ideas for reflective practice and summaries of key points are also included, aiming above all else to improve the relationships, responses, care and practice necessary to be effective in interventions and treatment with those experiencing mental health concerns and dilemmas. Ideal for all health, social, psychological, legal and spiritual care students and professionals wanting sound theoretical and practical guidance, this book is highly recommended for General Practitioners and General Practice Registrars, healthcare assistants studying NVQ and health visitors. Educationalists, managers and service developers in health and social care will also appreciate its solution-focused, practical approach. "…a useful read for all adult and mental health nurses…"
Preface. About the editors. List of contributors. Terminology. Cautionary note. Other books by the editors. Acknowledgements. Dedication. Palliative care within mental health: the need. Compassion, respect and dignity. Overcoming ethical dilemmas. Overcoming cultural dilemmas. The family. End-of-life. Assessment. Pain management. The young person and suicide. Long-term mental health. Dementia, Alzheimer's and confusion. Creutzfeldt-Jakob Disease and palliative care. Euthanasia, assisted suicide and mental health. Palliative care and substance use: special considerations. The heart of care and caring. Index.